2 Peace, perfect peace, by thronging duties pressed: To do the will of Jesus, � this is rest. 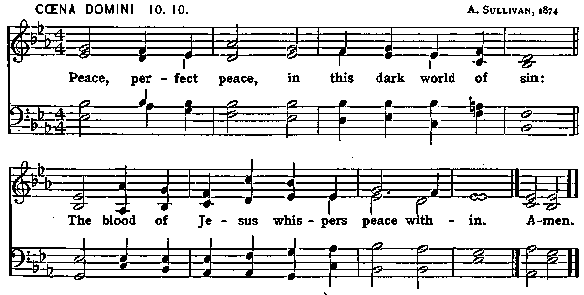 3 Peace, perfect peace, with sorrows surging round: On Jesus' bosom naught but calm is found. 4 Peace, perfect peace, with loved ones far away: In Jesus' keeping we are safe, and they. 5 Peace, perfect peace, our future all unknown: Jesus we know, and He is on the throne. 6 Peace, perfect peace, death shadowing us and ours: Jesus has vanquished death and all its powers. 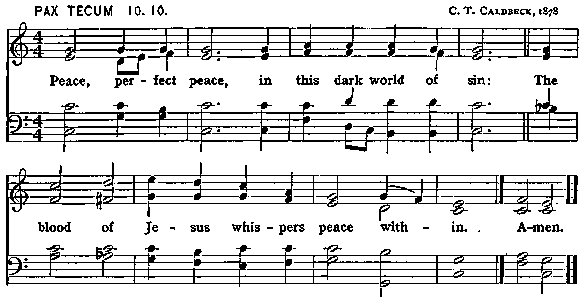 7 It is enough: earth's struggles soon shall cease, And Jesus call us to heaven's perfect peace.